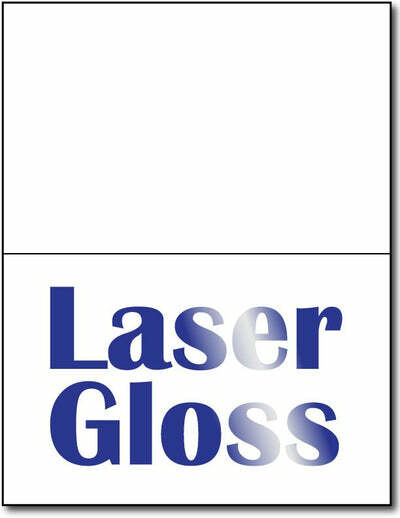 Our half fold laser glossy greeting cards are made from a 10 Mil (80lb cover, 216 gsm) photo card stock. These half fold glossy greeting cards come scored and measure 5 1/2" x 8 1/2" when folded. This half fold card stock is recommended for laser printers only. Item Group# 52399. Product features 10 Mil Laser Photo Gloss Half Fold Card Stock (80lb cover, 216 gsm). One Side Glossy, other side is plain, but printable. 8 1/2" x 11" Paper Cards measure 8 1/2" x 5 1/2" when folded. Laser Compatible Only. Scored for Easy Folding. Available in 25, 100, and 250 Sheet Packs.